Upgrade your quesadilla game with our Healthy Living Easy Quesadilla Recipe! 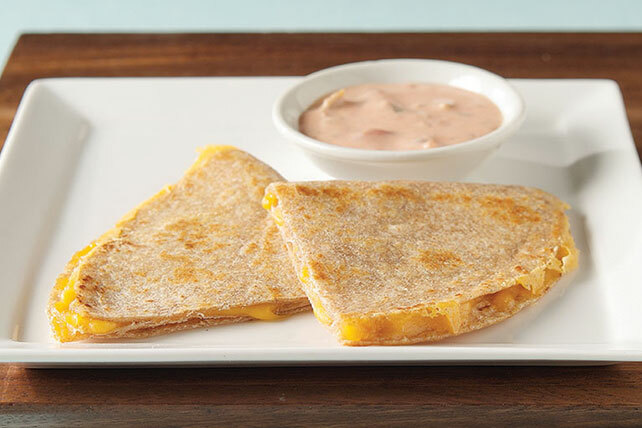 The tasty salsa-and-ranch dipping sauce is what makes this easy quesadilla recipe shine among the rest. Heat large nonstick skillet sprayed with cooking spray on medium heat. Sprinkle cheese on half of each tortilla. Fold tortillas in half; add to skillet. Cook 2 to 3 min. on each side or until lightly browned on both sides. Meanwhile, mix salsa and dressing. Cut quesadillas in half. Serve with salsa mixture.